Yellow Plates: Each speed bump section is embedded with (6) reflective yellow safety plates of weather resistant, composite material for protection from salt, freeze and thaw. 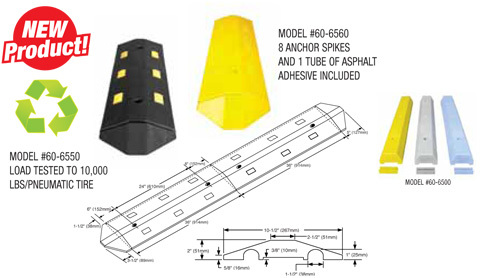 End Cap: 5” Safety Snap On End Cap - sloped modular profile prevents tripping by pedestrians. Can be used as a cable cover - bottom sides include 1” x 1.5” channels for protecting temporary or permanent cables or hoses. A standard speed bump system section includes (2) main pieces, (2) end caps and (1) connector clip. Main pieces may be added and connected to form larger units. Flexibility allows it to contour to road crown. 60-6500Y PARKING STOP-YELLOW 8”W X 4”H X 72”L 15 LBS. 60-6500B PARKING STOP-BLUE 8”W X 4”H X 72”L 15 LBS. 60-6500G PARKING STOP-GRAY 8”W X 4”H X 72”L 15 LBS. 60-6550 SPEED BUMP-CABLE GUARD 10”W X 72”L X 2”H 15 LBS. 60-6560 SPEED BUMP-CABLE GUARD 10”W X 108”L X 2”H 25 LBS.